In this talk, Joseph Tabbi introduces a new literary and arts collective, Electronic Text + Textiles, whose members are exploring the convergence of written and material practices. While some associates create actual electronic textiles, Tabbi has explored the text/textile connection as it manifests itself in writing produced within electronic environments. His online laboratory consists of two literary web sites, EBR (www.electronicbookreview.com), a literary journal in continuous production since 1995, and the Electronic Literature Directory (www.eliterature.org), a project that seeks not just to list works but to define an emerging field. Rather than regard these sites as independent or free-standing projects, Tabbi presents their development in combination with the current (and similarly halting) development of semantically driven content on the Internet (e.g., The Semantic Web, or Internet 2.0). His purpose is to determine to what extent *concepts* can flow through electronic networks, as distinct from the predominant flow of *information*. The latter, in which documents are brought together by metatags, keywords, and hot links, is arguably destructive of literary value. Where tagging and linking depend on direct, imposed conectivity at the level of the signifier, the creation of literary value depends on suggestiveness, associative thought, ambiguity in expression and intent, fuzzy logic, and verbal resonance. At a time when powerful and enforced combinations of image and text threaten to obscure the differential basis of meaning as well as the potential for bringing together, rather than separating, rhetorical modes, Electronic Text + Textiles seeks to recognize and encourage the production of nuanced, textured languages within electronic environments. JOSEPH TABBI is the author of two books of literary criticism, Cognitive Fictions (Minnesota, 2002) and Postmodern Sublime (Cornell, 1995). He edits ebr (www.electronicbookreveiw.com) and hosted the 2005 Chicago meeting of the Society for Literature, Science, and the Arts. He is Professor of Literature at the University of Illinois, Chicago. This session is supported by Goldsmiths Digital Studios, Graduate School and the Pinter Centre for Performance and Creative Writing. For more past events, see ?php if (” == ”): ?Goldsmiths Digital Studios Thursday Club ?php endif; ?‌ [PDF format: 1.32MB]. 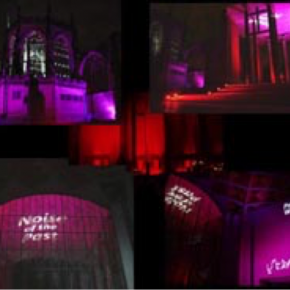 ‌14 Nov 2010 8.30pm, Coventry Cathedral (Free): A music spatial performance marking 70 years of the very night the blitz (code named Operation Moonlight Sonata by the Luftwaffe) started over the city. Produced by Noise of the Past the starting point for this commission was an inter-generational dialogue in poetry about how one asks and tells of the experiences of war between Sawarn Singh – a WWII soldier who fought in Burma, the Middle East and Africa before moving to Coventry – and his grandson Kuldip Powar. Musical composer Francis Silkstone responded to the haunting poetic dialogue as the basis of Post Colonial War Requiem, which will be performed by moving musicians in spatial interaction with the Cathedral. Benjamin Britten’s original War Requiem inaugurated the newly-built Cathedral in 1962 which also took the poetry of Wilfred Owen as its inspiration. ‌This piece brings an international and multi-cultural perspective to a series of events on the blitz taking place nationally, that normally offer a European angle, with little recognition of the labour and lives of those from the colonies during WW1 and WW2. Many of whom were through family and friends involved in these war. It takes the classic War Requiem by Benjamin Britten as a source of inspiration, which is in itself a pacifist piece and turns it around to face the colonies. 7.15 – sirens with light projection over Coventry Cathedral ruins, followed by bells ringing all over the city. 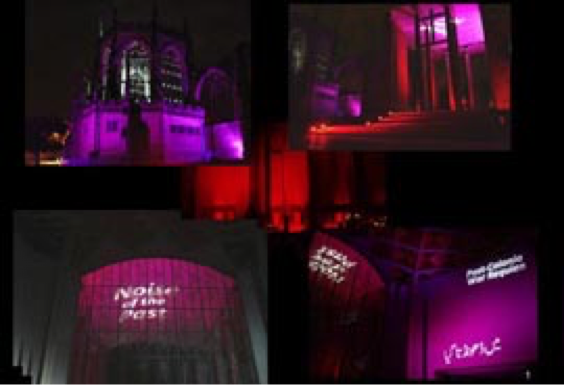 8.30pm – 30 min live performance of Post-colonial War Requiem by Francis Silkstone in main cathedral. Programme of events run until midnight. FILM SCREENING, UNRAVELLING original score by Nitin Sawhney, directed by Kuldip Powar, 20 mins. Produced by Noise of the Past, Unravelling is a short film that pursues an inter-generational poetic dialogue in the Urdu language, between the director and his Grandfather Sawarn Singh – a War Veteran who was a soldier in the Indian Army that fought for the British in WWII: in Burma; The Middle East and Africa. Through poetic motifs the film explores the complex themes of war & remembrance, loss & exclusion and colonial legacy in contemporary Britain. The project sees director Kuldip Powar join forces with award-winning composer Nitin Sawhney in a collaboration that subverts traditional director-composer working methods. Sawhney responds to the poetry creating an intricate moving score that serves as a starting point for Powar’s beautifully crafted imagery. What emerges is a sensory experience that is both evocative and haunting. This film invites us to explore our own ambivalence towards collective and personal stories of war.